Update, December 5: Epic Games have settled one of the copyright lawsuits against a prolific Fortnite cheater. They have also responded to the case of the 14-year-old cheater. Fortnite have settled on a copyright lawsuit against Charles ‘Joreallean’ Vraspir. The company took Vraspir to court accusing him of a breaching the game’s End User License Agreement by injecting unauthorized code into the game, allowing him to cheat. Vraspir is also suspected of having helped develop some Fortnite cheats. Ten million people have played Fortnite Battle Royale. The two parties did go to court, but quickly settled on an agreement, signed by Vraspir, that requires him to refrain from ever carrying out copyright infringement again, to destroy all cheats, and not to cheat ever again. If Vraspir is found in breach of the agreement, he will have to pay $5,000. Epic also responded to a similar case against a 14-year-old cheater, claiming they were not in breach of laws concerning information about minors, as they were not aware of the defendant’s age at the time. They have agreed to redact or initialise the defendant’s age in any future correspondance with the court. It seems likely that an agreement similar to Mr Vraspir’s could be made with the defendant. Update 14:55, November 27, 2017:Epic Games explain in a statement that they had to issue the legal notice to protect their copyright. Epic Games have explained in a statement that they issued the legal notice against the 14-year-old player to counter the counterclaim the child made to Epic’s DMCA takedown notice against his video. “This particular lawsuit arose as a result of the defendant filing a DMCA counterclaim to a takedown notice on a YouTube video that exposed and promoted Fortnite Battle Royale cheats and exploits. Under these circumstances, the law requires that we file suit or drop the claim. Update 13:04, November 27, 2017:That’s a problem for Epic,as minors can’t be sued directly. It’s possible that Epic identified the child through YouTube or other social media without ascertaining his age,as TorrentFreak speculate. In a letter to the court, the boy’s mother makes a number of further attacks on Epic’s suit. She says the game’s EULA (terms and conditions), upon which Epic rely heavily, require parental consent for minors to play the game, which she claims she did not give. She also points out that Epic are claiming profit loss when the game is free-to-play, and challenges them to prove this with a P&L statement showing how her son’s cheating affects their bottom line. Epic’s suit alleges that, by modifying Fortnite, the cheaters violated copyright law. However, the boy’s mother says her son did not help to make the cheat software and only downloaded it, arguing Epic thus “has no capability of proving any form of modification.” Finally, she claims that, by releasing her son’s name publicly, Epic violated Delaware state laws concerning the release of information about minors. You can read the mother’s letter in full via Torrentfreak (to whom, thanks) here. Original story, October 13, 2017: Epic Games are suing two of Fortnite Battle Royale’s most prolific cheaters. 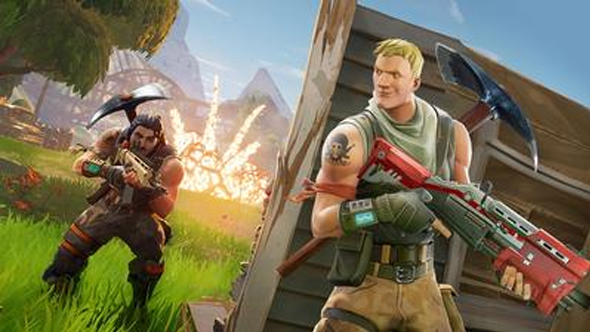 Complaints filed with a North Carolina federal court accuse the two players of violating Epic’s copyrights and End User License Agreement. Last week, the company wrote about the issues that cheaters were causing the game, saying they had already banned thousands of accounts, and that they were “exploring every measure to ensure these cheaters are removed and stay removed” from the game. Epic clearly weren’t messing around, and the two lawsuits they’ve filed accuse the two alleged cheaters – whose names on the lawsuits are Mr Broom and Mr Vraspir – of infringing on the game’s copyright by changing the game’s code. That infringement also means that the players – one of whom has been banned from the game nine times – is in breach of the game’s terms of service. Both defendants are linked to a cheat provider, working as moderators and support staff on a site that helps players access cheats. They both face charges of $150,000 in statutory damages if they lose the case. If you’re up to date with your legal jargon, here are copies of the full complaints filed against Vraspir and Broom.